Any jam of your choice , Strawberry , apricot , raspberry . 1. Pre heat the oven to 375 FH or 190 Centigrade for 20 minutes . 2.Grease a thin pan , usually called jelly roll pan and line with parchment or butter or wax paper . Use rectangular or square pans . The edges of the pan should not be high . 3.Beat the eggs with electric hand beater until triples in volume and becomes very stiff . Don’t add the sugar while beating the egg . Beat the eggs first . Beating the eggs is very important for Swiss roll . For the perfect texture , many separates the egg yolk and egg white . But you can achieve the same result beating the whole egg well . It took me almost 8/9 minutes to get the right consistency . The eggs should be of room temperature ,otherwise it won’t get the volume that much . So beat the eggs until they triples in volume , are foamy and stiff . When you will see , the mixture doesn’t falls off from the beater , it means you have the right texture . 4. Now beat with sugar , until it dissolves . add the vanilla essence . 5. Sieve the flour and cocoa powder together . Now fold in with the egg-sugar mixture with a spatula in three batches . Always fold in clock wise motion, that will ensure even mixing . Pour in the pan and immediately transfer it to the pre-heated oven and bake for only 10-12 minutes . Don’t over bake . 6. While the cake is baking, sprinkle some powdered sugar over a butter paper larger than your cake pan and get one damp kitchen towel ready . The damp towel will help to retain the moisture and the butter paper dusted with powdered sugar will do the same after rolling it out . 7.Once the cake is baked, immediately turn it over on the tea towel. Peel off the parchment/ butter paper and immediately roll cake into the tea towel while it is still warm . Do it quickly . If you hesitate to roll out or take time , it may break apart . If you don’t roll it now , if the cakes cool down the cake will tend to break apart while trying it to roll . Now place it on the powdered sugar dusted butter paper, sprinkle some powdered sugar over the cake and roll again . Let it cool compeletly and then keep it in the fridger for 20- 30 minutes , before you spread the jam and cream. 1. Whipping or beating the eggs is very important . Keep beating the eggs with electric hand beater or mixer at high speed until triples in volume and stiff . The mixture should not be runny , so when you takes your beater off the mixture , it should be stiff; should not be runny . Whipping of egg is important , because it produces a more flexible sponge cake that doesn’t crack when rolled. For this reason , to ensure more , some whip the egg whites and egg yolk separately . But if you beat the whole eggs well , that’s good enough. 2. Always use room temperature eggs to get the more volume . 3. Don’t beat the eggs and sugar together . Add sugar after your eggs are beaten thick , when it has reached triple in volume and becomes stiff . If you add the sugar , from the very beginning , the egg won’t rise that much and won’t get that stiff the way we want . 4. I don’t use baking powder or any other leavening agent in Swiss cake , though some people does . But it always seems risky to me , because if the cake rises too much it may crack or break apart while folding it . 5. Pan size really matters . Use a pan , that doesn’t have the higher edges . If the cake is too thick , the cake will break apart while folding . So lay a thin layer of batter on the pan , but not too thin . You have to remember the cake won’t rise that much . So keep it in mind pour your batter on to the pan. 6. Don’t over bake and sponge cakes are usually baked on high temperature than the usual ones . I prefer 375FH or 190 centigrade . Just bake for 10-12 minutes . Check after 10 minutes , if the toothpick inserted come clean , it’s ready . 7 . Prepare a damp towel and a butter paper dusted with powdered sugar , a little larger than the pan to fold the cake . Damp towel and powdered sugar would help to retain the moisture . 8. Roll immediately while it is still hot . Do it quickly . 9. After spreading jam and cream and folding , don’t try to cut the cake immediately . Try to set it in the refrigerator for at least 1 hour . Golap pitha , the beautiful , rose shaped pitha has two versions . One is dried one like goja or pakkan pitha , fried and coated with thick sugar syrup and the other is a soft , Gulabjamun style version , soaked in sugar syrup . The basic dough being the same . I’m sharing both the processes. 2 cardamom and little stick of cinnamon. Make a two thread sugar syrup with the ingredients mentioned above . That is the syrup should be thick . Don’t forget to add lemon juice to prevent crystallization . If your sugar syrup is not thick , the pithas will get soggy . Make one thread sugar syrup with the ingredients . The syrup should be thin . If your syrup is thick , the pithas will not get soaked well and will remain hard . 1. Boil milk. Add few pinches of salt . When the milk is at boiling point add flour and mix well .Just like the dough made for roti or chapatti. 2.Transfer the dough to a bowl. Knead well.Add the ghee or oil.When the dough cools a bit add the beaten egg and breadcrumbs. Knead well. You may find it difficult to incorporate everything smoothly but keep kneading. You may need to add some extra breadcrumb to work comfortably with the dough.The kneading part is very important. The smoother and glossy dough you can make by kneading, the softer pitha you will get after soaking in the syrup for the soft version of the pitha . 3. Now make large balls from the dough . Roll out each ball into a big , medium thick roti . Cut them into small rotis with the help of biscuit cutter or any round object . 5. Heat enough oil in a pot so pithas can be deep-fried. Now, the frying part is very important. If not fried well, the pithas will remain hard, especially in the center, even in the sugar syrup. And for the dried version , if not fried well , the pithas will not be that crunchy .The oil must be heated on medium low flame and it must not be too hot. Too hot oil will make the pithas get the outer color fast but leaving the center raw. The oil must not be cold either. Carefully, heat oil on medium low heat and fry the pithas well until dark golden brown. 6. For the soaked in syrup , like gulabjamun versions ,transfer the hot pithas immediately into lukewarm sugar syrup and soak them for at least 7/8 hours. If soaked well, the pithas will be soft like gulabjamun or laalmohon. Remember , the pithas should be hot , well fried and the syrup should be luke warm , not hot . If you put the pithas into hot syrup , the texture of the pithas will be ruined . DON’T PUT THE PITHAS INTO HOT SYRUP. 7. For the dried version , after frying coat them with the thick luke warm sugar syrup . If the syrup is not thick , the pithas will be soggy soon . 1.Kneading and frying is very important to soak perfectly in the sugar syrup. Knead very well until glossy. 2.While frying, the temperature of the oil must be perfect. It should neither be too hot or mild hot. If it is too hot the pithas will go dark brown without being cooked in the center. And if oil is little hot the pithas will absorb a lot of oil and will taste bad. Therefore, oil should be heated on the same temperature from beginning to end. It should be on low medium heat and bubble should occur when you add the pithas. Remember oil should not be so hot that smoke can be seen. Also, remember to fry them with patience, with more time, so that they are perfectly fried inside out. 3.Always put the pithas in luke warm syrup. If you put them on piping hot syrup, the texture of the pitha will be ruined. For the soft gulabjamun like pithas , the pitha should be very hot and the syrup must be thin and luke warm , neither hot, nor cold or room temperature. The pithas get soaked well in thin, luke warm syrup . The syrup should not be thick for softer version of this pitha . On the other hand, for the dried version of pitha the syrup should be thick . Otherwise they will get soggy soon. Tapioca Pudding / Saabudaana Kheer /Saagu’r payesh , an easy-peasy , yummy dessert..
3. Ruh Afza or any colorful syrap. 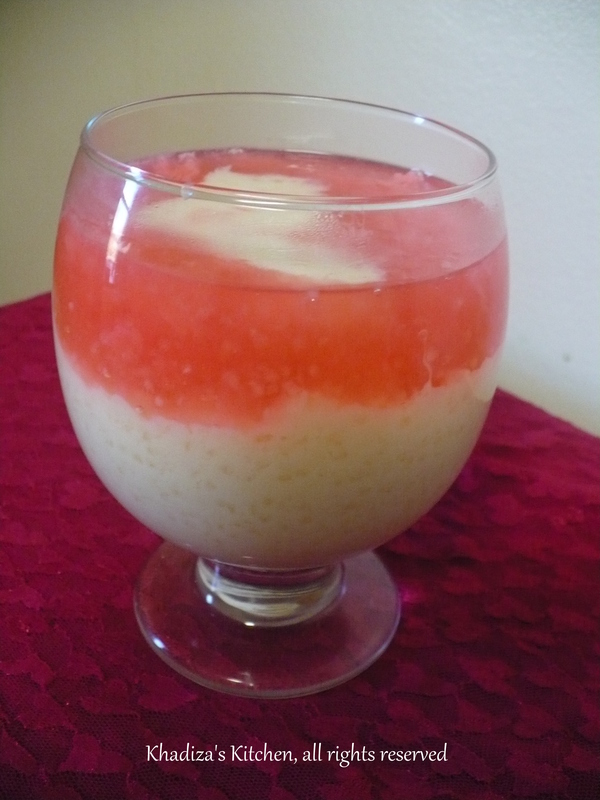 1.Wash and soak the tapioca in water until becomes a little plump and fluffy. It may take 30-45 minutes. But careful , it must not get sticky. 2. Take 100 gram of tapioca from the water and cook it on medium flame in 1 can evaporated milk and 1 cup regular milk until gets translucent . Add the cardamom, cinnamon while cooking the tapioca. Stir Occasionally .Tapioca gets thicker after it cools down,so if you see the consistency a bit thick adjust it adding little milk . Add the condensed milk , stirring continuously now. as I said Tapioca gets thicker after cooling down so don’t make it too thick. You may add sugar, if needed. 3.Pour the pudding into individual ramekins leaving a little space for the topping. Let it cool . 4. In another pot boil the remaining 50 gram tapioca in water until translucent .Add the sugar and finally add any syrap or Ruh afza. 5. Let it cool and then pour over the pudding and garnish it with cherries,any other fruits, cream or ice cream.